The complete lack of moving parts of the EX100/200-Series insertion flow sensor is the source of its reliability. Brass and stainless steel models withstand a variety of temperature, pressure, and chemical conditions. The EX-Series has no rotor to stop turning in dirty water and there are no bearings to wear out. Like all magmeters, when used in chemical injection applications, these meters should be installed upstream of the chemical line (or far enough downstream to allow complete mixing of fluids before the meter). A rapidly reversing magnetic field is produced in the lower housing. As the fluid moves through this field, a voltage is generated that is measured and translated into a frequency signal proportional to flow rate. This square wave signal can be sent directly to a PLC or other control or can be converted using any of the Seametrics family of indicators and converters. A modular system of electronics can be attached directly to the flow sensor or remotely mounted. The Seametrics FT420 provides full indication of rate and total, plus 4-20 mA output. The AO55 provides blind 4-20 mA output, and the DL76 is a battery-powered data logger. 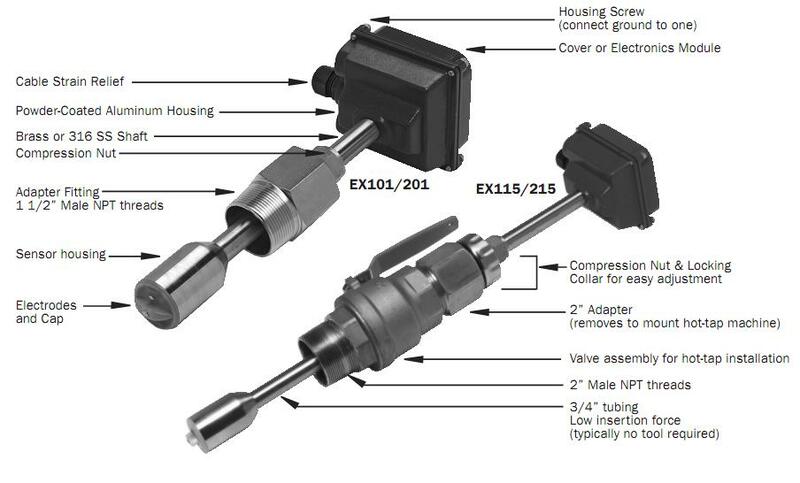 The adapter fitting of the EX sensor is standard male NPT, and can be directly threaded into ordinary saddles or threaded weld fittings. The EX115 and 215 include an isolation valve, allowing hot-tap installation, or installation and removal under pressure; a bronze ball valve is standard, with a 316 stainless steel valve option if needed. Reverse flow output and immersibility are optional.